Q41. What are the two methods of refrigerant recovery? Q42. Recycling refrigerant reduces contaminants through what two processes? Learning Objective: Recall the inspection points for open-type compressors and repair procedures for common problems in open-type refrigeration compressors. 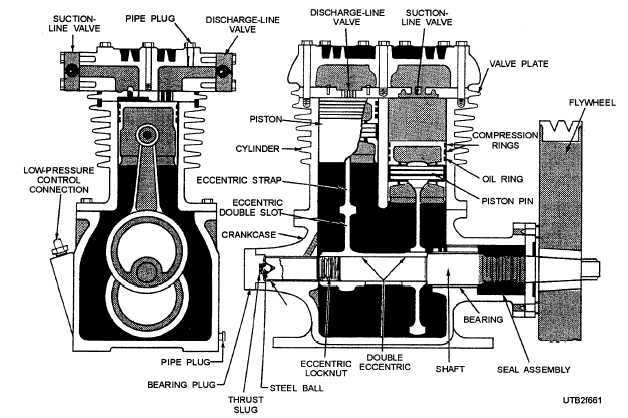 Inspection points for open-type compressors and repair procedures for common problems in open-type refrigeration compressors are covered in this section. Figure 6-61 shows a vertical single-acting reciprocating compressor. Some of the duties you may perform in maintaining this and other open-type compressors are discussed below. When the suction side is obstructed, the unit tends to run continuously or over long periods. Connect the gauge manifold and start the unit. This pressure gauge (HI) will not indicate an increase in pressure. The low-side gauge (LO) will fluctuate and will not indicate any decrease in pressure. Clean out any obstructions and recheck again by using the test gauge assembly. Figure 6-61. - Vertical single-acting reciprocating compressor.